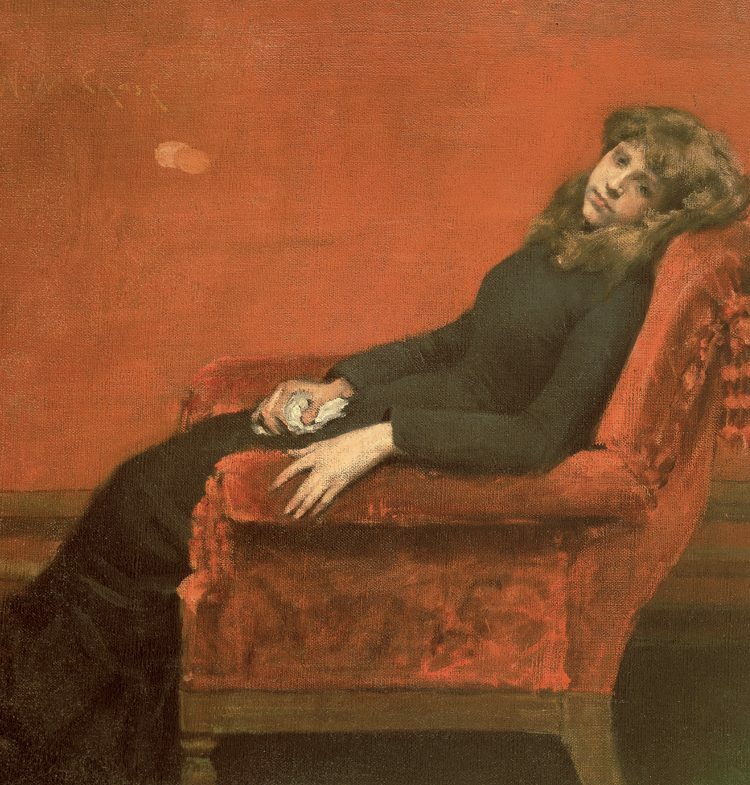 This is one of William Merritt Chase’s defining early masterworks that showcases his burgeoning talent as a still life painter and portraitist. 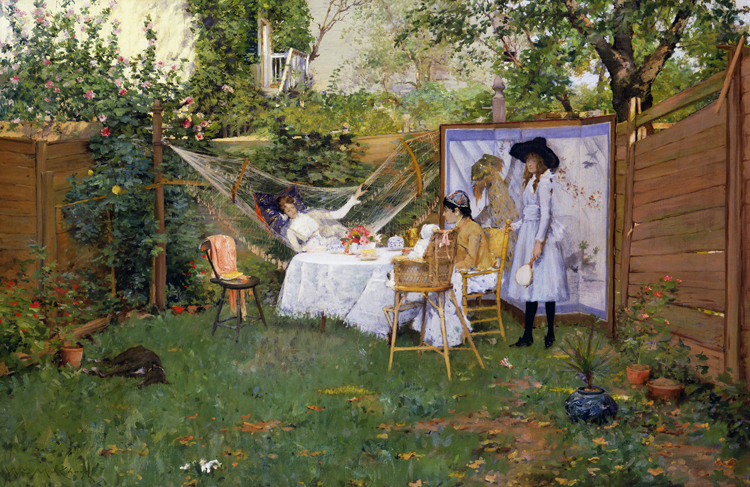 Dora Wheeler was one of the artist’s first private students. Chase painted this portrait just as Wheeler returned from her training at the Academie Julian in Paris to establish a career in New York. The portrait exudes the quiet dignity of the sitter with the assured placement of her curled hand on her face, relaxed pose, and direct eye contact with the viewer. Dora’s mother, Candace Wheeler, owned a decorative textile firm, Associated Artists, in which her daughter worked as a designer. In the same building was Dora’s own art studio, where Chase painted this portrait. She sits on a grand Elizabethan chair with a blue art deco bowl full of narcissus on top of a carved ebony Chinese tabouret. The brilliant golden tones of the hanging tapestry extending from one edge of the canvas to the other serve as a dramatic foil to the rich brown and blue contrasting tones. From the beginning, Chase conceived of the painting as an exhibition piece, one that would showcase his virtuosity and bolster his reputation. Chase’s approach builds on the legacy of the opulent illusionism of his Munich manner and asserts, with its richly layered palette of yellows, blues, and browns, the vibrancy of color and virtuoso brushwork that earned the artist international acclaim. Indeed, the groundbreaking nature of Portrait of Dora Wheeler catapulted Chase’s career, earning him honorable mention in 1883 at the Paris Salon and the gold medal in Munich’s Crystal Palace exhibition. By contrast, the following year, when the painting made its United States debut in the Society of American Artists exhibition, it met with mixed praise because of its radical departure from the conventions of portrait painting. 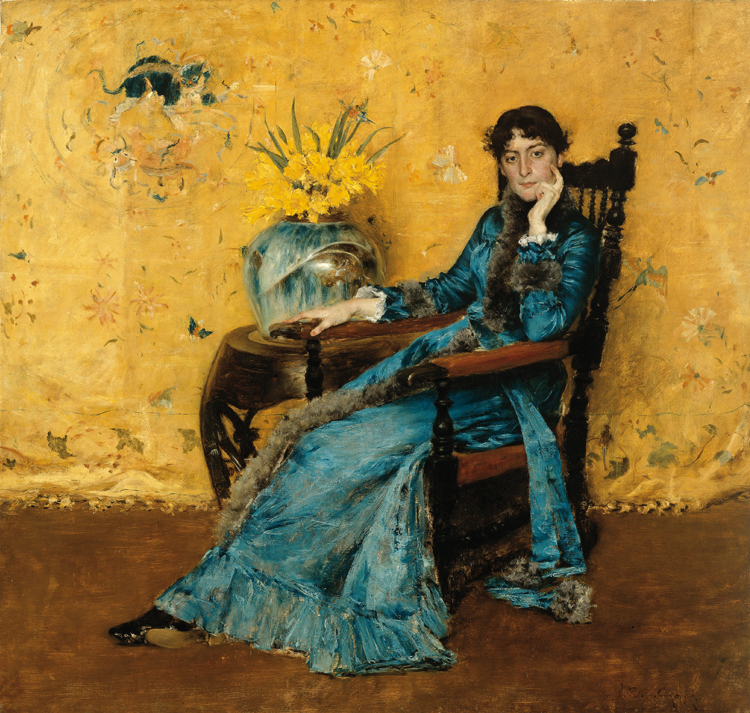 In his review of the show, painter W.C. Brownell expressed his dismay at how unagreeable the portrait was, arguing that Miss Wheeler “counts for next to nothing in it”—a mere decorative prop in the overall ensemble. Perhaps emulating the artist Whistler who signed his works with a butterfly, here Chase inscribed his personal insignia into the painting. Look at the upper left of the painting for the cat chasing its tail.